'MLM' The American Dream Made Nightmare: How did Eric Voegelin predict the 'political religion' centred on Donald Trump? How did Eric Voegelin predict the 'political religion' centred on Donald Trump? At first, this latest vague statement was generally taken to mean that a terrorist incident had occurred in Sweden, but when it was established that no such incident had occurred, some media commentators concluded that the President might have been confusing Sehwan in Pakistan (where a suicide bomber blew himself up among devotees at the Sufi shrine on Friday, killing 80+ people) with Sweden. Yet, how could Trump and his advisers have made such an outrageous and insulting gaff? Other commentators then realised that the President could, in fact, have been referring (but without thought or clarification) to a recent alarmist report on immigrants and rising crime levels in Sweden, broadcast by Fox News. Yet this explanation merely demonstrates that Donald Trump has absolutely no conception of any diplomatic problems which his clumsy words might create, and that he expects his audience to have the same cable-television viewing habits, and resulting simplistic model of reality, as himself. Gene Huber is perhaps Donald Trump's most devoted fan. Mr Huber is an emotionally-vulnerable middle-aged man who proudly boasts of having fallen head over heels in love with Donald Trump and, as we all know, love is blind. Indeed if anyone were to challenge Mr. Huber's current model of reality, his reaction can be predicted with almost 100% accuracy, because it is based on a two-dimensional comic-book narrative. President Donald J. Trump is a wise, strong and honest leader who has selflessly given up his comfortable life as a senior billionaire businessman and television celebrity, to come to the aid of his fellow citizens who are not only threatened by the external enemies of democracy and the American Way, but who have also been lied to and cheated by an array of internal enemies - stupid, and/or weak, and/or corrupt: bankers, politicians, bureaucrats, journalists, judges, etc. However, there is little quantifiable evidence that Donald Trump has done anything in recent months except violently character-assassinate anyone publicly dissenting from his own Utopian controlling scenario, whilst steadfastly pretending affinity with anyone and everyone whose support he needed to achieve power. Although a flock of smug commentators continue to roll their eyes and bleat that any comparison of the US President to totalitarian dictators (particularly Adolf Hitler) is 'anti-Trump hysteria,' the current evolving-situation is most certainly neither original nor unique and consequently, it cannot be fully-understood in isolation. 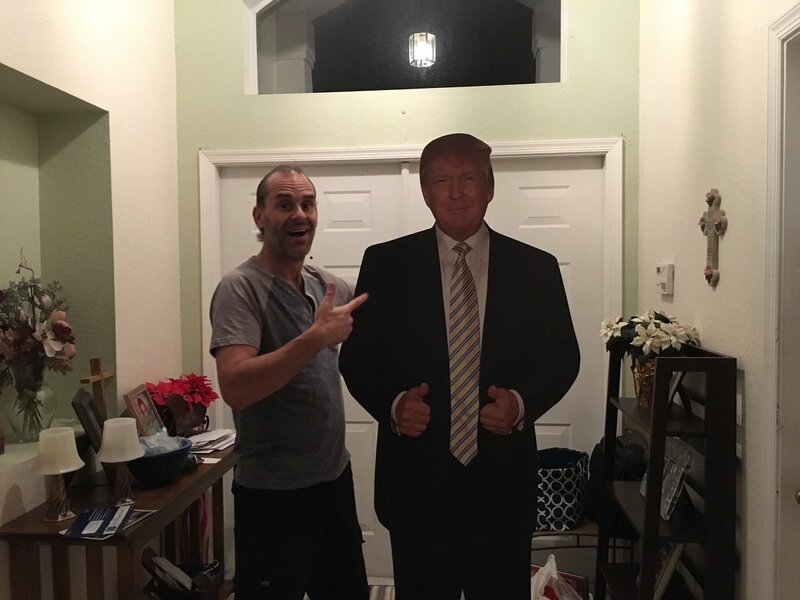 Thus, it cannot be denied that Gene Huber is an unabashed Trump groupie who quite literally worships daily before a life-sized cardboard image of his nation's elected-leader; praying to God to protect the infallible object of his devotion. Yet, imagine how easy it would be to exploit the likes of Gene Huber in their present unquestioning state of mind. One thing is certain, neither Donald Trump nor Gene Huber will have heard of Eric Voegelin - one of the most prolific (and difficult to read) authors of the 20th century - but if Eric Voegelin had still been alive today, I strongly-suspect that he would not have been at all surprised by the arrival of President Trump, because in many respects, he predicted exactly how this would come about. In the early 1930s, Voegelin (a young German, Catholic academic teaching in Austria) was an original observer who openly identified 'Nazism' as a dangerous ritual belief system founded on a non-rational 'racial' pseudo-science ('Ariosophy'), but presented in a far more-convincing modern encrypted jargon of 'nationalist politics.' Even though Voegelin also saw 'Soviet Communism' as part of a wider historical phenomenon which he described as 'Political Religion,' he faced arrest by the 'Nazi' regime and he fled to the USA. 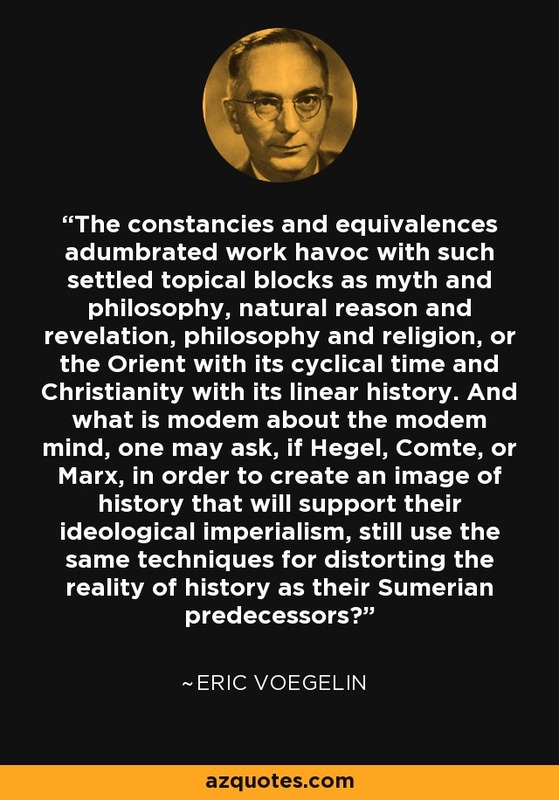 Voegelin subsequently produced a vast body of work which is a lofty (and linguistically complex) philosophical view of the history of human civilisation. Indeed, I wouldn't advise anyone to try to read Voegelin in pure form. That said, at the core of Voegelin's work can be extracted a self-evident truth which boils down to one plain language sentence. At times of mass-alienation (following: wars, natural disasters, economic crises, etc. ), history proves that would-be demagogues steadfastly pretending moral and intellectual authority whilst pursuing hidden criminal objectives, who at other times would have been almost universally-recognised as absurd charlatans, have found it much easier to become widely-accepted as authentic Messiahs. Didn't I read somewhere that Donald Trump once claimed his ancestors were Swedish? Anonymous - This article is a pretty fair explanation of Trump's Swedish family claims. One can't blame German immigrants to the USA for pretending that they were Swedish during WWI and WWII. In this instance, Donald Trump does genuinely seem to have once believed that his ancestors weren't German. Watch Donald Trump promoting fraud in Russia. Watch New 'Tiens/MLM' Documentary Here.